I have Actual Window Manager primarily because of dual monitor taskbars and tabbed windows explorer interface. On my Windows 7 system without Windowblinds it works flawlessly but on Windows 10 using any Stardock theme Explorer title bars become almost completely transparent and normal controls are invisible. Excluding explorer makes no difference. I have removed Actual Window Manager but I miss the tabbed interface and the switch monitors and other effects - not sure about Groupy. Any information regarding this ? Hello everyone. Sorry for my English. I installed the demo version (before I buy). There is a problem . Games from battle.net are closed without errors. Does not work . I added exe (games and battle .net)/ to program exceptions but nothing helped. I tried to solve compatibility problems, it did not help. games do not start (you have to delete windowsblinds) / Help please. Sean Drohan , thank you so much! It works . But there is one problem . After the reboot, Windows 10 services again turn on and you need to turn it off again each time. It is not comfortable . How can you automate this process or somehow turn it off forever? I hope you understand the meaning. sorry for my English. Yes, thank you so much! It works . But there is one problem . 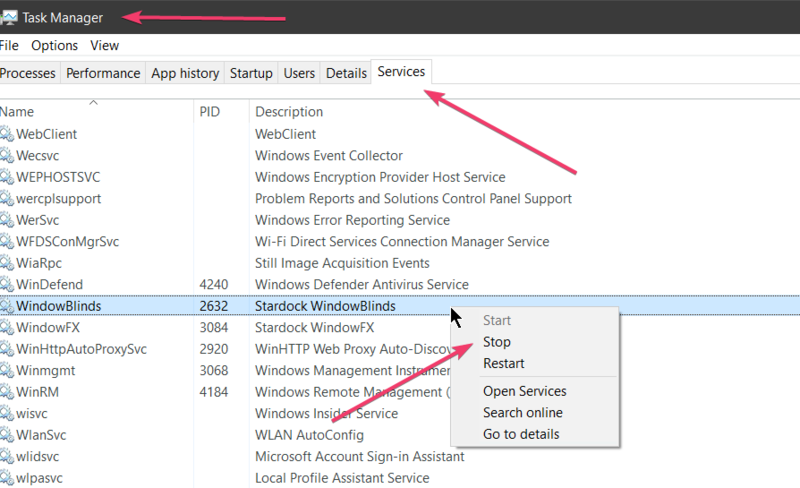 After the reboot, Windows 10 services again turn on and you need to turn it off again each time. It is not comfortable . How can you automate this process or somehow turn it off forever? ( I hope you understand the meaning. sorry for my English sir ) Hope you help me . I be waiting for answear . How can you automate this process or somehow turn it off forever? Sean Drohan thank you very mach ! Its working ! All people using Windows 10 should get this fix. PS : Today I tried the Windowsblinds in Windows 7 - no problems with the launch of any games and apps. I hope soon the new versions of your programs will work in windows 10 without problems with compatibility with games and applications. Dont work agan / Thits method work 1 or 2 times and now agan all crush , only delete wb help me start game. I am using a CTaskDialog and have Ice by Danioc running. The "title" does not show. I have tried Lantana and the result is just the same. See that the caption is "Exception". They should be showing a title.